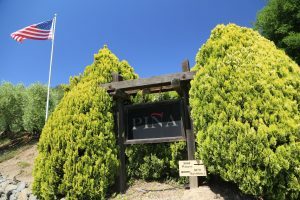 Piña Napa Valley released their first commercial wine from the 1979 vintage. Piña in Spanish means “fruit of the pine”. 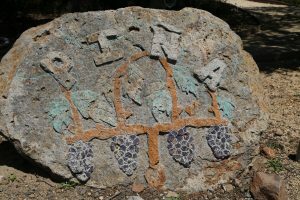 Four brothers: Davie (the face of Piña for numerous winery owners), Larry, Ranndy & John (unfortunately John passed away in 2017) own the winery; they are 6th generation Napa Valley residents and farmers. The only other Napa winery run by four brothers that we know of is Buoncristiani Family Winery. 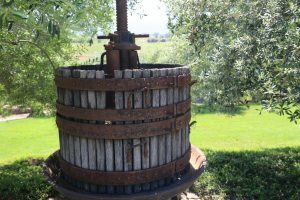 Both their maternal and paternal sides of the family have extensive history in California and the Napa Valley in particular. Their great-great grandfather Bluford Stice traveled with General George C. Fremont to California in a wagon train from St. Louis Missouri in the mid 1850’s. 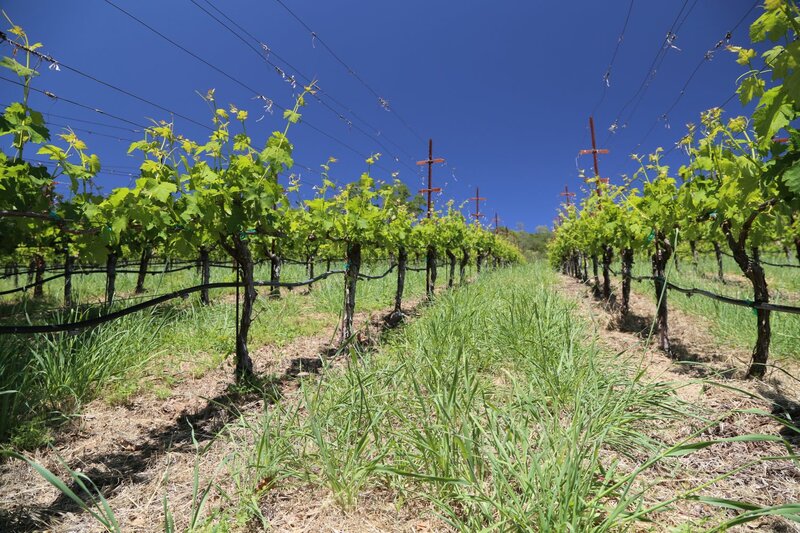 Bluford settled in the Napa Valley in 1856 – a tribute to his family name still lingers – Stice Lane is located just south of St. Helena. Interestingly enough, Bluford’s son Lafayette owned vineyards in the Napa Valley and was also a winemaker at what is now Martin Estate and at Inglenook Estate. All four brothers attended beautiful Cal Poly, San Luis Obispo. Course we are not biased at all considering CP-SLO was our alma mater! Today they run a vineyard management company that their father John founded in 1960. 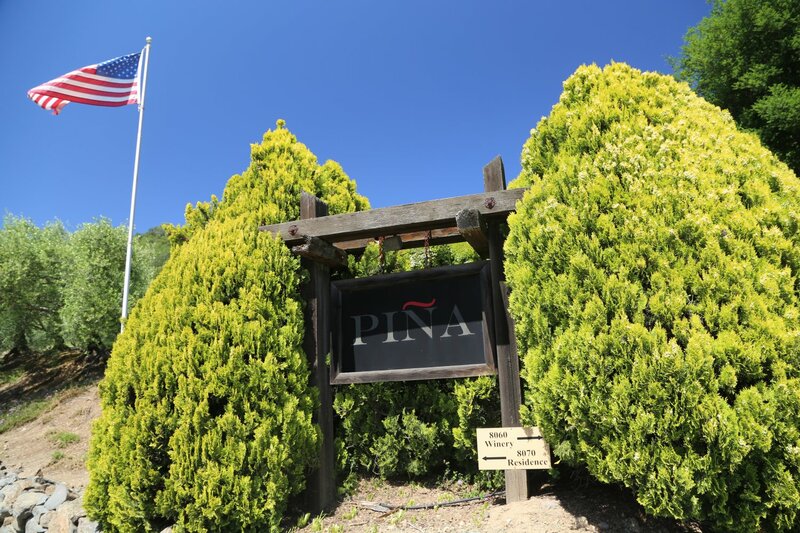 He called the company John Piña Jr. & Sons; today it is Piña Vineyard Management. 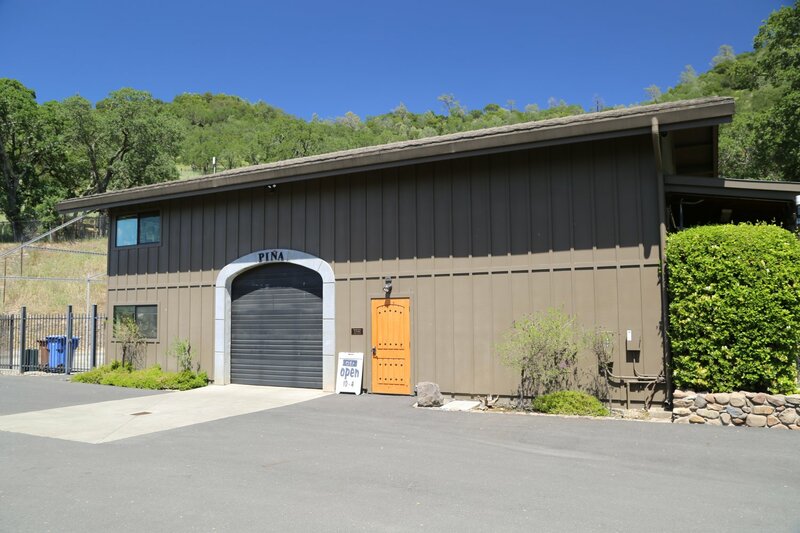 Their father also purchased the property in Rutherford perched on the lower slopes of the Vaca Mountain range next to the Silverado Trail (the current site of their winery). 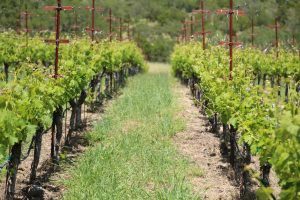 Piña Vineyard Management has overseen vineyards for numerous well known Napa wineries including Pahlmeyer, O’Shaughnessy, Cafaro, Schlein, O’Brien Family Winery, Gemstone, Roy Estate & many others. The bottom line is this family has a very long history in the Napa wine industry. 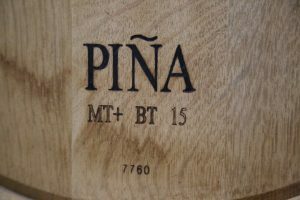 Despite being known for Cabernet Sauvignon, Pina released their first wine in 1979 – a Chardonnay. The existing winery was completed in 1983 but their real push into making wine commercially did not begin until 2000. 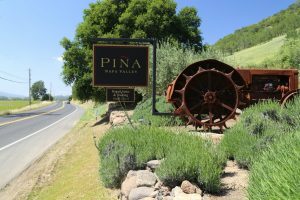 A rusted tractor and other farm implements next to their sign makes this winery easy to find on the east side of Silverado Trail. 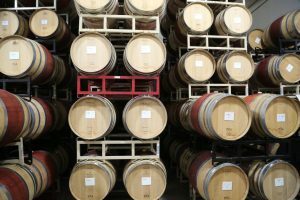 A tasting here is a throwback if you will – to when tasting rooms were about the wine and none of the other distractions that one often finds these days. There is no fancy architecture, reflecting pools or brilliant artwork. 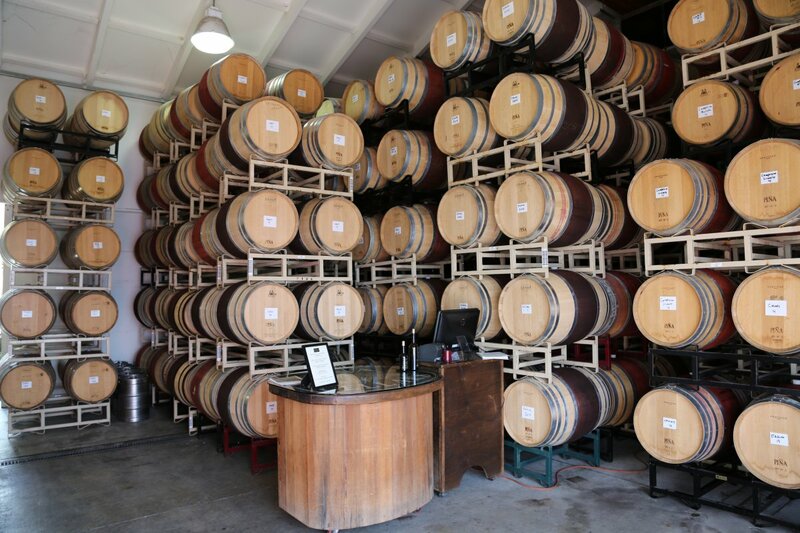 The tasting room doubles as the cellar with wine barrels stacked up all around the portable tasting counter. From the outside the winery has “shedlike” appearances. Despite its size, remarkably Piña Cellars has opted to remain a walk-in winery unlike a number of other Napa wineries who used to be open to the public by walk-in. 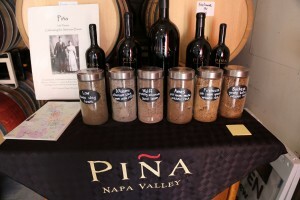 Piña produces some of the nicer Cabernet Sauvignons that we have tasted in Napa Valley. We’ve tasted a ton of wine for this project and it is extremely rare when all the wines at a particular winery fit our palate like a glove such as here. 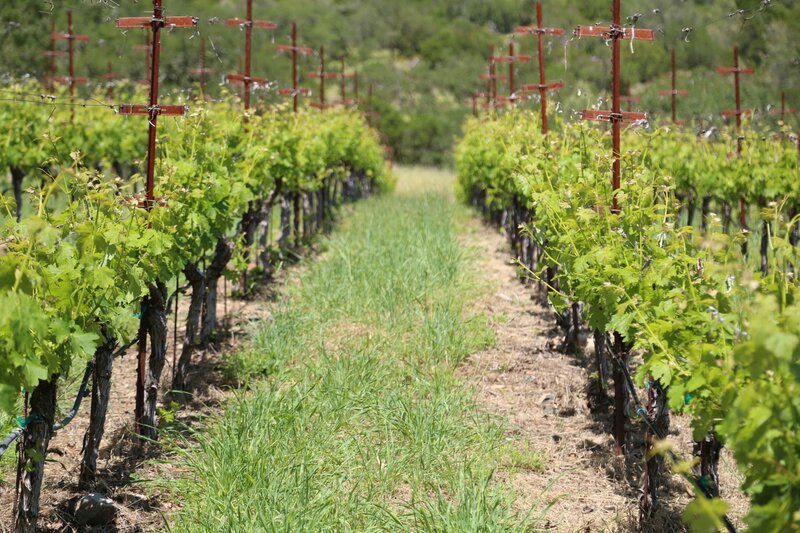 The focus of their wines is on 100% varietal single vineyard designated Cabernet Sauvignon. Piña is not known for Chardonnay but they do make a small, usually several hundred case production of a Oak Knoll grown Chardonnay from the Low Vineyard – a site next to the Muir-Hanna Vineyards which provided much of the fruit for Chateau Montelena’s award winning wine in the Paris Tasting of 1976. Piña currently sources their Cabernet Sauvignon from 5 vineyard sites in Napa; D’Adamo Vineyard not far from the city of Napa, Wolff Vineyard in Yountville, Ames Vineyard in Oakville, Firehouse Red Vineyard in Rutherford and Buckeye Vineyard on Howell Mountain. 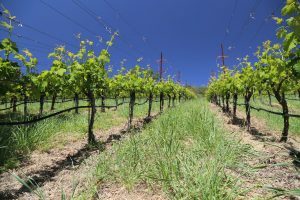 The Piñas planted and manage all of their source vineyards – and own the Buckeye Vineyard and Firehouse Vineyard (the several acre steep hillside vineyard growing behind the winery). This particular vineyard is named in tribute to when several firetrucks were kept on the property in the small shed that one passes just before pulling up to their parking lot. Incidentally, Davie has long been a volunteer fireman – his help was greatly appreciated during the October 2018 fires that burned hillside acreage in both the Vaca and Mayacamas mountain ranges. 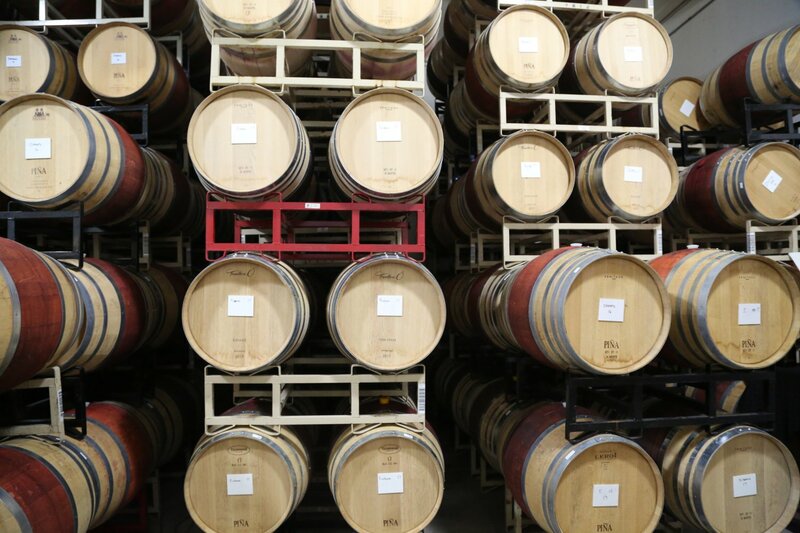 Production is fairly small – usually only several cases are produced annually; some of their wines are produced in quantities of merely several hundred cases. 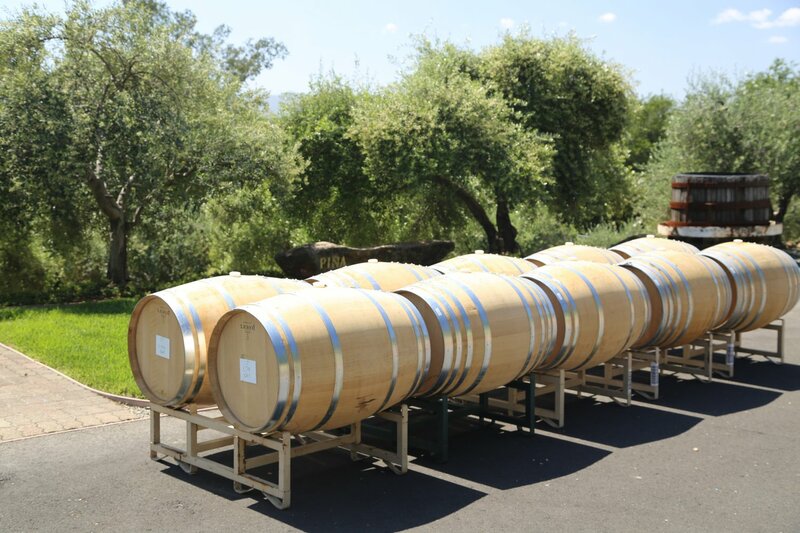 When we first visited they were selling out of wine far before their release dates so ‘futures’ of the wines were sold while they were still in barrel. As a result, during several of our early tastings we had to try wines from barrel. Several important characteristics of Piña produced wines are rich aromas and flavor, refined yet well structured tannins and a depth of character across the palate. 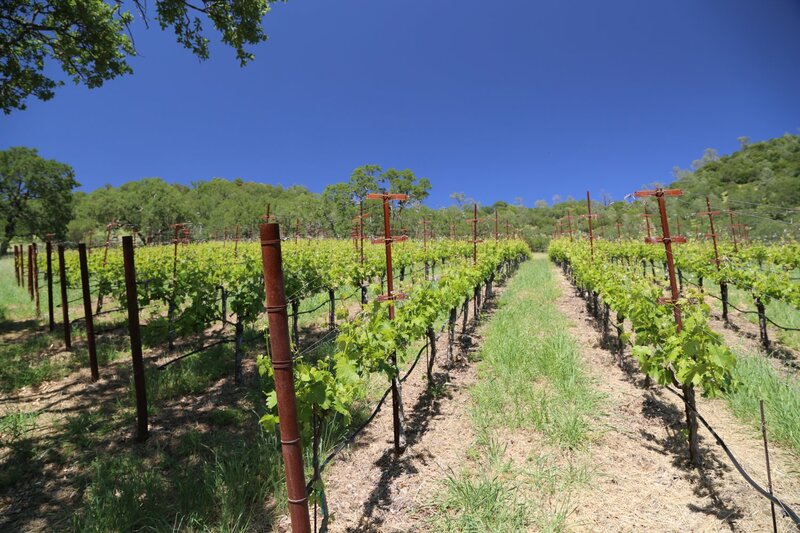 The 2013 Wolff Vineyard Yountville Cabernet Sauvignon is the softest of the wines we tried – shows notes of blackberry and boysenberry complemented by some wood spice characteristics on the bouquet along with earthy aromatics. For a robust vintage, this wine is quite approachable in its youth – there are layers of flavor along with fairly supple gravely type tannins anchoring a long finish. In contrast is the 2013 Firehouse Vineyard Rutherford Cabernet Sauvignon – shows lots of fruit on the bouquet – mostly darker fruit in its aromatic presentation – including blackberry, plum and dark cherry. Well layered, with big texture this is a wine that continues to show its power throughout a very long finish. Robust, course and gripping tannins linger for quite some time. The wine is also a bit savory with a dust quality on the palate along with decent acidity. 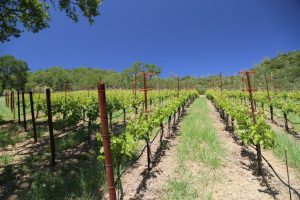 After trying this wine, the first words that came to mind were “this is a Texas wine” ideal for those who prefer their Napa Cabs big and bold – preferably with a well marbled steak. A couple highlights from older tastings include the 2005 Buckeye Vineyard Howell Mountain Cabernet Sauvignon. This wine has wonderful earthy aromas, almost dusty. The palate is rich yet refined and is extremely well balanced with notes of blackberry and chocolate towards the long finish which is also slightly smoky with just a touch of toasted oak. 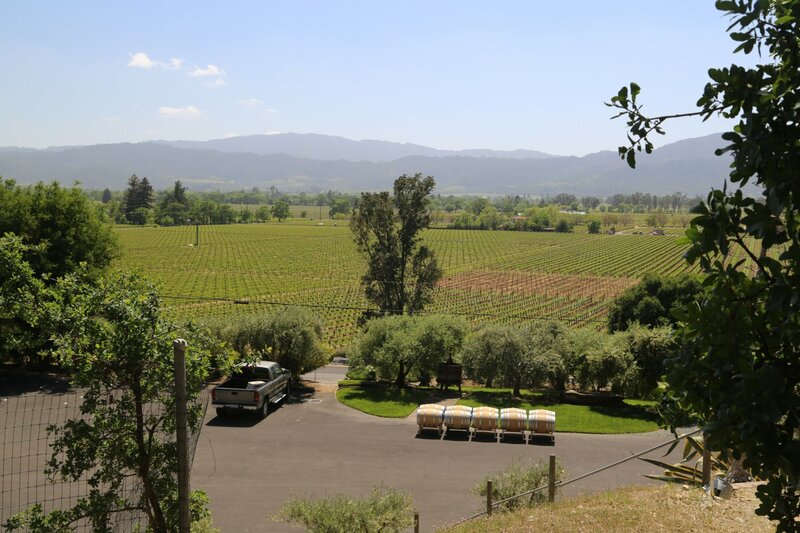 The wines from their Oakville, Rutherford and Yountville vineyards are produced in quantities of typically no more than several hundred cases each vintage while the D’Adamo vineyard tends to be their highest production Cabernet Sauvignon. They also make a vintage Cabernet Sauvignon based port-style wine (not every year) – as it says on the bottle this wine is meant to be “an after dinner Cabernet. It is sweet but not overly so. Steps lead up the hill a short ways to the edge of their vineyard; from here there are excellent views looking west over the Napa Valley.